The Geologic timeline (also called geologic time scale) is a system of measurement commonly used by earth scientists that relates rock strata to time, providing a rough history of geology and life (through the fossil record) on Earth. The geologic timeline is vast, stretching back to the formation of the Earth approximately 4.5 billion years ago to the present day and into the future until the destruction of the Earth. It is divided into various eons, eras, periods and other denominations to make studying it more practical and distinguish unique periods of time. Precambrian (or Pre-Cambrian) is an informal term in geology and paleontology for the time from the formation of the Earth, about 4500 million years ago (mya), to the Cambrian explosion of life that occurred 542 mya, which marked the beginning of the Paleozoic Era and the Cambrian Period. Little is known about the Precambrian, despite the fact that it constitutes the vast majority (about 88%) of our planet's history. 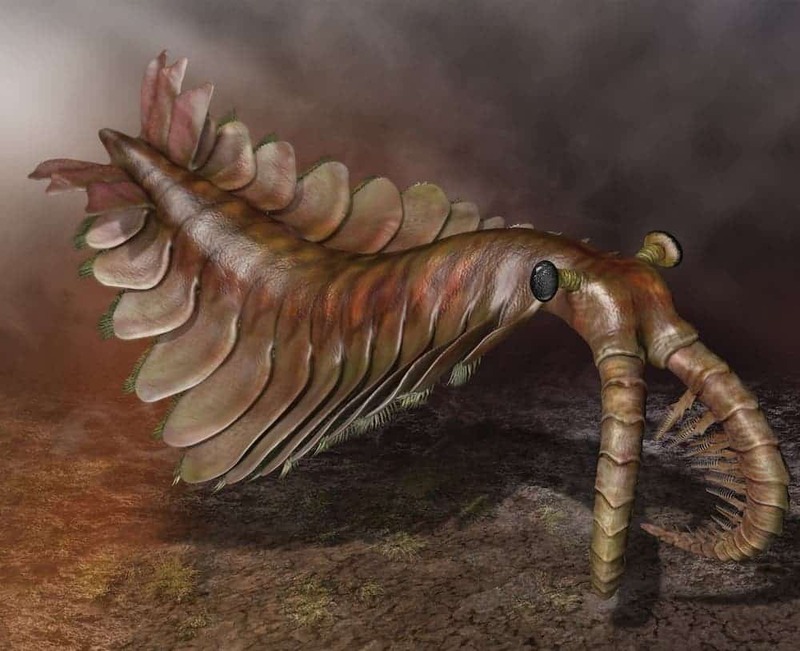 The Precambrian saw the origin of life, the evolution of photosynthesis, the transformation of Earth's atmosphere into its modern form, and the creation of iron ore. In non-scientific writing, the Precambrian is often imprecisely referred to as a "period" or "era", but "period" and "era" are technical terms of geology, and the Precambrian is itself made up of several periods (such as the Ediacaran) and eras. Precambrian is more accurately described as a supereon, as it consists of several distinct geologic eons: the Hadean, Arcean and Proterozoic. The Hadean eon saw the formation of the Earth around 4500 mya to around 4000 mya, the formation of the moon and the initial, hostile state of the Earth with heavy volcanism and poison waters when they existed. Very few traces of this time period remain due to geologic processes, and the few that do are in scattered locations such as Australia and Greenland, and to an extent on the moon as well due to the currently accepted model for its formation in this period. The Archean is the second eon of the early Earth (4000 mya to 2500 mya), and consisted of higher volcanism and a near-total lack of oxygen in the atmosphere. By the end of the period, the planet would have cooled significantly, allowing more familiar processes to act and for the formation of actual continents and continent bases to begin. At the beginning there was no functional distinction between the Hadean and the Archean (the division itself is artificial), and at the end it is theorized several continents would have risen and fallen, though less than 10% of Archean rock is known to remain across the planet, in locations spread across the globe. The most significant part of this time period would be that life began in this era, if not in the previous Eon, though what life there was would have been very rudimentary. The Proterozoic is the final eon of the Precambrian, lasting from 2500mya to 542mya. This eon marks the beginning of life in a way we would understand it (non simple) and the creatures that would ultimately make up the Cambrian explosion would have first evolved in this time period. Some of the most significant events of this time period would have been the first glacial periods, including a hypothesized time when all except the equator was locked under ice (Snowball Earth hypothesis) and the change of the atmosphere as oxygen rose from almost nothing to the current percentage, as well as triggering a mass extinction of lifeforms to whom oxygen was a poison in the same way carbon dioxide is to modern creatures that breathe oxygen. The Paleozoic Era is a geological era that started 542 mya and finished 252.2 mya, encompassing the Cambrian, Ordovician, Silurian, Devonian, Carboniferous, and Permian geological periods. It is marked in the beginning by the emergence of soft-shelled life, and near the end of the Era, marked by complex plants (the first modern ones), insects, fish, and small reptiles. Sea levels reached ~200m higher than today, due to the warmer climate at the end of the period, which was likely moderate at the start of the era. However due to continental drift it became much warmer in some places and much colder in areas where life was located. This era ended with the greatest known mass extinction in history. The Ordovician (from the Ordovices, a Welsh tribe) is the name given to a geologic period of time following the Cambrian and preceding the Silurian period. It lasted from 488 to 443 million years ago, and was the second period of the Paleozoic era. An extinction event is thought to have been caused by an ice age, and it started with an extinction event as well. The Silurian (from the Silures, a Welsh tribe) is a period of geologic time that lasted from approximately 443 to 416 million years ago. It was preceded by the Ordovician period (the boundary between the two is marked by a mass extinction event) and was followed by the Devonian period. The Silurian period saw the first appearance of coral reefs and jawed fish in the fossil record, in addition to widespread terrestrial plant life. The quarry in Devon whose rocks gave the period its name. The Devonian (from Devon, the English county where rocks from this period were first identified) is a period of geologic time that lasted from approximately 416 to 359 million years ago. It was preceded by the Silurian period and followed by the Carboniferous period. The Devonian period was marked by the formation of large continents, which would later conglomerate into Pangaea. It also witnessed extensive colonisation of the land by plants, and the emergence of the first terrestrial animals (insects and other arthropods). By the end of the period, the first amphibians had appeared in the fossil record. Marine life was dominated by bony fishes, which first appeared in the Silurian period. The end of the Devonian period was marked by a mass extinction event. The Carboniferous (coal-bearing) is the name given to a geologic period of time that lasted from approximately 359 to 299 million years ago. It was preceded by the Devonian period and followed by the Permian period. Its name is derived from the numerous coal beds that were laid down during this time. The supercontinent Pangaea formed during the Carboniferous period. Animal colonisation of the land increased, with the diversification of arthropods and amphibians. It was during the Carboniferous that most of today's so-called "fossil fuel" deposits were laid down. It is often divided into the Mississippian and Pennsylvanian time periods. The massive amounts of oxygen in the atmosphere enabled arthropods to grow to enormous sizes (for arthropods—think volleyball size, not monster-movie size). The Permian (named after the kingdom of Permia, Russia) was the final geological time period of the Paleozoic era, and extended from 290 million years ago to 250 million years ago. It was preceded by the Carboniferous period and succeeded by the Triassic. The start of the Permian was cool and dry; however, by its end the temperature on Earth reached levels higher than at any time since the Cambrian explosion and higher than at any point since. The continents were in one giant landmass called Pangaea. Young Earth creationists claim that the split of Pangaea was a result of the flood. Many Young Earth creationists address the high volcanic activity due to the meteorite that is said to have impacted the Earth, and allegedly caused the flood. They state this even though actual scientists claim there was a drought — which, you might recognize, is the opposite of a flood. Indeed, over the course of the Permian, sea levels dropped around 80 meters, creating many basins of salt from evaporated seas. The Permian Mass Extinction was the worst extinction within the most recent 600 million years of Earth's history. It happened somewhere between 251 and 248 million years ago, marking the transition from the Paleozoic to the Mesozoic Era. This event is estimated to have killed off 90-95% of sea life and about 70% of land organisms. Various hypotheses have been put forth on what caused this event including an asteroid or comet impact, volcanic activity, radiation from a nearby supernova, global warming, or a combination of any or all of the above factors. Many scientists speculate that the formation of Pangaea played a major role in the Permian Mass Extinction, in that all of the continents coming together would have reduced the amount of shoreline and induced desertification of the interior of Pangaea. Furthermore, the amount of land over both the North Pole and South Pole would have caused massive glaciation, and further reduced shallow-water marine habitats by lowering the sea level. The Triassic is the name given to a geological time period which extended from 251 to 199 million years ago. The Triassic is the start of the Mesozoic Era. It is preceded by the Permian and succeeded by the Jurassic. It followed the largest extinction event known, the P/T, with 95% of species dying. It is the first geological period in which dinosaurs appear. Yay, dinosaurs! Oil, too! Synapsids also survived into and developed in the Triassic; they would later evolve into mammals. The Jurassic is the geological time period between the Triassic and Cretaceous periods and lasted from 199.6 million years ago to 145.5 million years ago. The Jurassic period is named for the Jura mountains in Europe, where rocks from this era can be found. Dinosaurs were the dominant animal group in this period, and the largest animals to ever walk the Earth emerged during this period, the sauropods—just like in the movie. However, most of the creatures shown in Jurassic Park actually lived during the Cretaceous. The Cretaceous was a geologic period of time that lasted from approximately 145 to 65 million years ago. It was preceded by the Jurassic period and followed by the Paleogene period, the latter boundary also forming the demarcation between the Mesozoic and Cenozoic eras. It was the last period of the "Age of Reptiles": dinosaurs, pterosaurs and marine reptiles were the dominant global megafauna. The end of the Cretaceous period was marked by a mass extinction event known as the K-Pg (Cretaceous-Paleogene; the "K" is from the German Kreide for chalk) Extinction. It was formerly known as Cretaceous–Tertiary (K–T) boundary. The boundary consists of a thin deposition layer with abundant iridium. Iridium is scarce in the Earth's crust but is abundant in asteroids and other space rocks. The layer has been conclusively shown to have been caused by an impact by an asteroid or possibly a comet) named Chicxulub that struck off of what is now the Yucatán Peninsula of Mexico at 66 mya. The asteroid was clearly a devastating extinction level event, as evidenced by the fossil record below and above the K-Pg boundary. There is still some scientific debate about whether the massive Deccan volcanic eruptions (in what is now India), which lasted from about 66.25-65.5 mya, had a contributory effect to the extinctions. The extinction event killed off all large animals, including all dinosaurs other than birds. In addition, many marine reptiles, several mollusc groups, and other organisms went extinct. This is the most famous and widely known mass extinction (due to the mass appeal of dinosaurs), though it isn't the largest or most recent. The largest event is considered to be the Permian–Triassic extinction event, and the most recent is occurring now, the Holocene extinction event. The Cenozoic Era is a geologic period that includes the last 65 million years. It begins with the mass extinction of non-avian dinosaurs 65 million years ago. The Cenozoic Era is divided into Paleogene and Neogene periods, which are further broken up into nine epochs. Given the relatively recent time frame, the Cenozoic period is the best understood of all geological time periods including everything from weather features, temperature, geological changes, changes in life forms including detailed evolutions, and extinctions. The Paleogene was a geologic period that lasted from approximately 65 to 23 million years ago. It was also the first period of the Cenozoic era. It was preceded by the Cretaceous period and followed by the Neogene period. (Formerly the Paleogene and Neogene were lumped together as the Tertiary period.) The Paleogene period is itself divided into three epochs: the Paleocene, Eocene and Oligocene. The Paleogene period began with the K-T extinction, an event that removed most of the then-dominant dinosaurs from the ecosystem, along with many other groups, and allowed mammals and the one surviving group of dinosaurs, birds, to proliferate. The Neogene was a geologic period that lasted from approximately 23 to 2.6 million years ago. Alternatively, it has been argued that the current Quaternary period should be included within the Neogene period. It followed the Paleogene period, and was the second period of the Cenozoic era. It is subdivided into two epochs: the Miocene (23 to 5.3 million years ago) and the Pliocene (5.3 to 2.6 million years ago). During the Neogene period, the continents roughly assumed their present positions and the world's flora and fauna evolved into forms of which the majority would be comparable with modern species. The genus Homo, which would eventually give rise to humans (us! ), also appeared at the end of the Neogene. The Quaternary is the current geologic time period, which began approximately 2.6 million years ago. It is divided into two epochs: the older Pleistocene (2.6 million to 11,700 years ago) and the current Holocene (11,700 years ago to the present). Its status, however, is disputed, as some geologists claim that it should be included within the preceding Neogene period. The name Quaternary itself derives from the obsolete Primitive (or Primary), Secondary and Tertiary periods which were classified by the Italian geologist, Giovanni Arduino, in 1760. The Primitive referred to crystalline basement rocks, Secondary to consolidated sedimentary rocks, and Tertiary to alluvial rocks that were thought to have been deposited by the Global Flood but now corresponds to the period of time covered by the Paleogene and Neogene periods. Whether it remains a separate period or not, the Quaternary is of particular importance to humanity as this is the time when Homo sapiens evolved. The period has also been marked by frequent glacial periods, of which more are forecast to come (unless global warming changes the plan and ends the ongoing ice age). Assuming that the processes of the past continue to operate as they have and something else doesn't drastically change the current geologic motions, the Pacific Ocean will be subducted under the Eurasian and North American Plates as the Atlantic Ocean expands, pushing the two continents together into a new super-continent, nicknamed "Amasia" (not to be confused with the Amero) by some, potentially centered around the North Pole. Beyond that we have only wild speculation as to what will happen, as Amasia is predicted to form around a hundred million years in the future and from there it's anybody's guess, with scientists' guesses including the extinction of complex (multicellular) life first and simple (unicellular) one later due to the Sun's increased luminosity caused by its aging, the former causing also a greenhouse effect that will evaporate Earth's oceans and will either reduce it to a hot, desertic, planet with liquid water only at the poles -and at first- or transform it into a Venus-like world or worse, in all cases plate tectonics stopping due to the lack of liquid water lubricating the plates. Much later on, the Sun's transformation into a red giant will strip away Earth's atmosphere converting the planet into a lava-covered world that will probably be engulfed by the Sun, or if it survived the Sun's death maybe reduced to just its bare core, everything else stripped away by interactions with the Daystar's extended envelope. However Geologic time will continue until the world itself ceases to exist, even if it's reduced only to a dead, frigid, husk orbiting a long dead star. Radiation of more modern animals: most modern bird forms have appeared; most modern mammals have appeared. Major extinction of invertebrates (P-T). Trilobites fade away forever. First land plants; bryozoans appear. Trilobites begin to specialize. Macroscopic fossils of soft-bodied organisms. 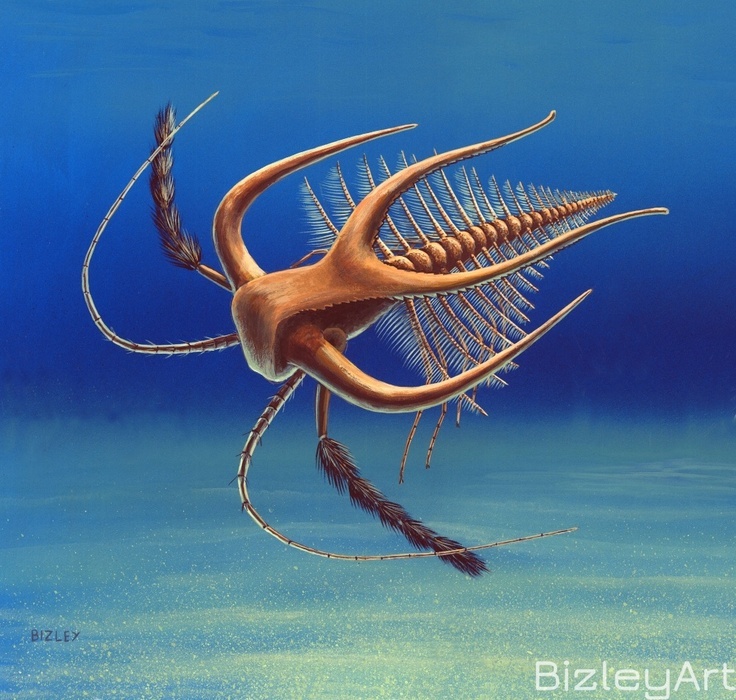 ↑ Marrella, Anomalocaris, and Hallucigenia lived during the Cambrian, if you don't believe this. ↑ How they reconcile accepting the existence of Pangaea and its sundering into today's continents with Young Earth Creationism is a possibly interesting question. ↑ 5.0 5.1 5.2 5.3 5.4 Devastation detectives try to solve dinosaur disappearance: Retracing the terrifying, mysterious final days of the dinosaurs by Thomas Sumner (2:30pm, January 25, 2017) Science News. ↑ Some lucky birds escaped dino doomsday: Feathers, wishbones and more were a dino thing before they were a bird thing by Susan Milius (2:30pm, January 25, 2017) Science News. This page was last modified on 13 February 2019, at 23:40.